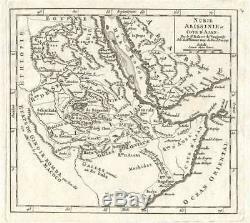 1749 Vaugondy Map of Abyssinia (Ethiopia), Sudan and the Red Sea. WE SELL ONLY ORIGINAL ANTIQUE MAPS - NOT REPRODUCTIONS JOIN OUR WEEKLY MAILING LIST FOR NEWEST STOCK. Title: Nubie Abissinie et Cote d'Ajan. Description: This is a lovely 1749 map of Abyssinia, Sudan and the Red Sea by Robert Vaugondy. Covers from Arabia and Egypt south to Mogadishu and includes parts of modern day Sudan, Ethiopia, Somalia, Yemen, and Saudi Arabia. Notes several kingdoms, rivers, important cities, and other topographical features. Notes coastal features in the Red Sea. The source of the Nile is notes correctly as Lake Tana (Lake Dambee). This map was published in the 1748 edition of Vaugondy's Atlas Portratif Universel et Militaire. Size: Printed area measures 7 inches high by 8 inches wide. Additional Services Conservation Framing Services: Geographicus recommends basic conservation framing services for any antique paper. We do not offer this service. Antique Map Restoration Services: Geographicus can repair and restore your antique map. Services include deacidification cleaning flattening and backing. The item "1749 Vaugondy Map of Abyssinia (Ethiopia), Sudan and the Red Sea" is in sale since Thursday, September 20, 2018.